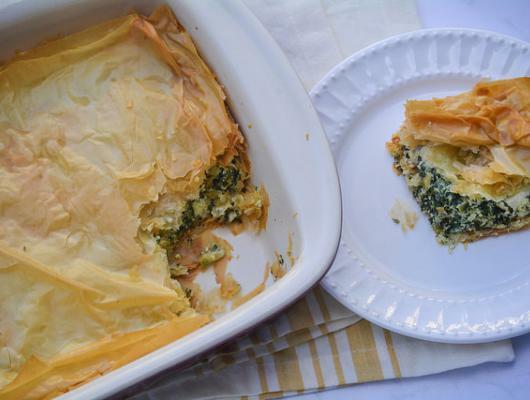 Take 3 thin slices of phyllo and layer into 9x13 casserole dish, brush the top piece of phyllo with olive oil. Do this same process 2 more times on the bottom of the casserole dish. (Approximately 9 pieces of phyllo, doesn't need to be exact). Mix together eggs, milk, feta, drained spinach, parsley, oregano, garlic, salt and pepper. Layer this mixture onto phyllo dough. Then repeat the same phyllo dough layer process 3 more times (9 more pieces), brushed with olive oil every 3 and lay these on top of the spinach mixture in the casserole dish. Make sure the top layer is brushed with oil. This week on Behind the Plates I’m talking BRUNCH! I’ve got some inspired and original recipes that are ideal for potlucks or holiday hosting. I’m starting with today’s recipe for a Spanakopita Egg Bake Casserole. Many Sunday’s our house becomes a revolving door with friends stopping by to visit, watch some football, and of course….EAT. A lot of my weekend style meals and appetizer type recipes get their taste testing done on these occasions. Recently, I had a few ideas for some breakfast and brunch recipes and they needed to be shared with a crowd. So, I decided to make our most recent Sunday celebration a brunch theme. Now that you know why my December posts are full of morning themed recipes, let’s discuss this delicious casserole. I don’t know about all of you but, I absolutely love the Greek dish, Spanikopita. 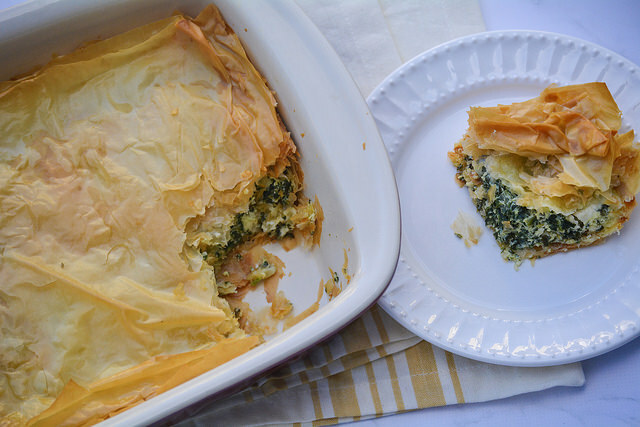 It’s essentially flaky phyllo dough layers that sandwich a spinach and feta mixture. It’s got earthy undertones, bright bursts of salty cheese, and a buttery crisp crust. To make my version more appropriate for a brunch celebration, I added eggs and milk to the filling. The result is a fluffy quiche style filling. It has all the same flavor notes as it’s original form but, with some added texture. This dish went fast! I had a table FULL of food and while most of it was polished off, this dish went astonishingly quick. It may be that most of us, including myself, had seconds and thirds. Either way, I think that’s proof enough for you to bookmark this recipe for your next breakfast or brunch occasion. Check back later this week for a sweet solution for your brunch tables!